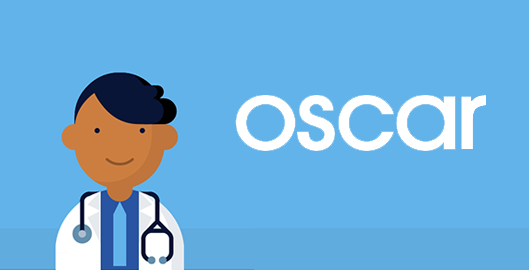 I’ve written before about why I think Oscar Healthcare is really doing a great job at creating a new customer experience around health insurance (read my post here). Recently, I put the insurance to the test. In mid July I was getting ready to go on a 2 week work trip during which I’d be taking 7 different flights. For about the last month, I’d had a sore throat and felt totally run down. I had tried resting, making crazy juices with my juicer, cough syrup, acupuncture, yoga, and all kinds of over the counter remedies. But nothing seemed to help. Concerned that I had a run down immune system and that I’d be at increased risk of getting sick during the work trip, I decided to play it safe and use Oscar’s “Talk to a doctor” feature less than 24 hours before my flight … I know, I know, very last minute planning on my part! While walking home with an armful of stuff, I opened up the iPhone app in my free hand and tapped on the “Talk to a doctor” button, which lead me to this screen where it told me a bit more about what would happen next. After I tapped on the “Request a call” button, I was taken to a screen where it showed me the phone number they had on file for me and then I had to confirm that I wanted someone to call me. Literally, within 1 minute, a board certified doctor from Oscar Health called me. No trekking to a doctor’s office. No giving my information to a receptionist. No waiting. Also, did I mention it was a Sunday?! The doctor introduced himself, read off some information that Oscar had on file for me and had me confirm it (such as any allergies, age, birthday, etc). Then he asked me to describe what was wrong and proceeded to ask a bunch more questions. At one point, he asked me to exhale loudly into the phone to see if it sounded like I had some respiratory issue. Unfortunately I was walking down a loud NYC street, so that didn’t work out too well! But, I can see how in a quiet environment a doctor would be able to diagnose something just be listening. Or, I imagine if you gave permission, you could FaceTime with the doctor to show them a rash or a cut or something like that. When all was said and done, he spent 20 minutes on the phone with me and sent a prescription to my local pharmacy. The doctor was super friendly, thorough, patient, and educational. 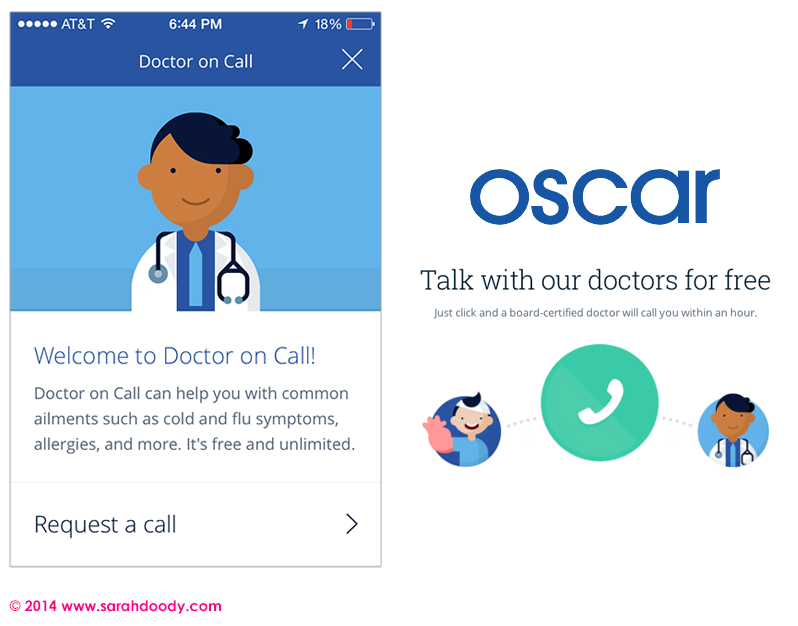 Best of all, the “Talk to a doctor” feature is free with Oscar! I love this and would definitely use this again. It’s a win win for everyone. It keeps me out of a walk in clinic, which probably costs Oscar a lot of money. And it saves me a ton of time and money, not to mention the risk of getting sick (or just stressed from waiting) at a walk in clinic. When I login to the app or the website on my laptop, I can see a record of the call including the doctor I talked to, a few of his notes, the prescription, and the length of the call. I love having this information at my finger tips! I imagine this would be even more helpful for people with families or who have a lot of medical issues. I am really interested in how health records evolve, especially with Apple’s Healthbook which you can read more about in TechCrunch, Wired, and Forbes. PS: If you are working on something in the health industry, please get in touch! I am really interested in anything health related with specific interest in how we can help people change their behavior through deriving meaning from metrics. Learn more at my other site PersonalMetrics.